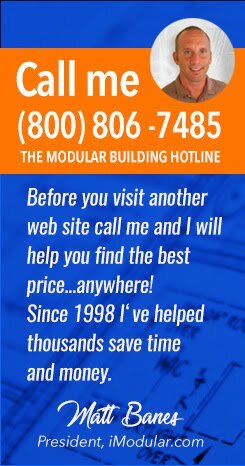 This post will help you find the best price for buying a modular building or portable classroom. Modular building and portable classroom suppliers use a number of factors to set their lease (rental) and purchase prices for both used and new modular structures. Throughout the year market conditions and modular building supplier inventories change, so from month to month prices may be set higher or lower and inventories will fluctuate. Depending upon the demand for specific types and sizes of modular buildings and whether or not a supplier has a well-stocked inventory, the price to rent or buy could go from a highly competitive “great deal” to a “seller’s market premium” in no time. Here are some buying scenarios that can help you save time and money if you are searching for any type of modular building, modular classroom or even a mobile office trailer. Buy smart! Best Case Scenario #1: You are interested in buying one or multiple used modular buildings and are flexible with what the floor plan layout is. This puts you in the driver's seat to shop for the best deal from local suppliers. If you contact several suppliers you will eventually find the best deal for your money. Best Case Scenario #2: Your school district needs multiple portable classrooms for a minimum of 18 months (or more) and you advertise the contract for public bid. This will create a very price competitive situation and attract the quality suppliers to bid. You retain the right to award the contract to the most qualified supplier. Worst Case Scenario #1: You have an immediate need for one or multiple used modular classrooms or offices during peak season (spring, summer). The suppliers will most likely need to charge a premium for rent or purchase due to low inventories or they will need to supply you with the "best" and most expensive or the "worst" and still expensive of their inventory. In the modular building business supply and demand can work for or against you. Worst Case Scenario #2: You want a new modular building quickly - and its peak season. This situation happens on a regular basis because schools typically try to install modular classrooms during the best weather in spring and summer. Ultimately the modular building manufacturers are super busy during these months as well. So if you do not place your order and secure manufacturing line time in advance you end up in the back of the line. This can cost your business, school or daycare center program valuable time and money. If you are in the market for a modular building I suggest trying our online price quote tool. This form takes a few minutes to complete and it sends your request one time to local suppliers. This is the best way to meet the local suppliers and get the absolute best price available.